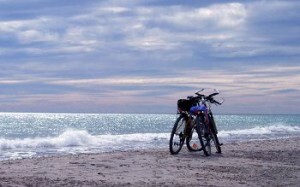 If you are new to Montpellier or just visiting, you will be surprised that you can easily go all the way to the beach by bike. This is actually one of the easiest and most fun ways to go to the beach. It will take you about 1 or 1:30 hours each way. It’s much better than the alternatives. Going by car is a hassle, because you likely get stuck in traffic and you will have a very hard time parking your car. Going by tramway is an option, but it can get crowded in the summer. If you don’t have one already, the first thing to do is to get a bike. 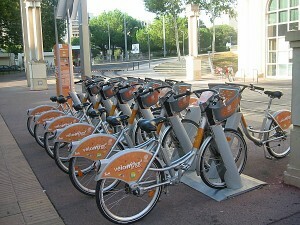 The bike rental system is called Velomagg. You can either rent a bike from one of the automatic rental stations around the city (payment by credit card) or you can rent a bike directly at the tourist office or the Velomagg office next to the train station. Be sure to arrive early if its the weekend. After ten or eleven on sunny weekends there might not be any bikes left. Note: If you don’t have a credit card with a chip (Americans) your card won’t work at the automatic stations. However, you’ll find a telephone number at the station that you can call to rent a bike using just your credit-card number. If paying a bit more is not a problem for you, consider renting a bike from a bike shop. The bikes will be lighter and in better shape, and won’t be limited in terms of time. Check out our list of bike shops. The bike shop « Ville & Vélo » close to the train station rents bikes for 25 Euros a day. There are basically two destinations for the beach that you can reach easily from Montpellier; Palavas and Carnon. There are bike paths to both. The bike path to Carnon follows the tram 3 line. The bike path to Palavas follows the Lez river. We strongly recommend the one to Palavas, since the bike path itself is much more pleasant. It passes along the river and then by the lagoon to arrive in the little beach town of Palavas. The bike path to Carnon passes along a big road and through retail areas. Finding your way to Palavas is quite easy. If you’re starting out from the historic center (tourist office, train station), you will pass through the « Antigone » district until you arrive at « Place de l’Europe ». Go a little further until you hit the Lez river. You follow the river downstream a few hundred meters and cross over to the left-hand side of the river. From there you just follow the bike path along the river all the way down to the sea. It will pass through Port Marianne, Port Arianne (Lattes), the lagoon and by the horse stables to arrive in Palavas. Palavas is where Montpellier goes on the weekend. You’ll find seafood restaurants, ice-cream shops and shops. You can find a place on the beach right in Palavas, or if you’d like something a bit more quiet, follow the beach to the right for about a kilometer or so. Soon you will find yourself outside the town among nature and sandunes. If you continue a bit further, you can even visit the medieval Cathedral of Villeuve de Maguelone. About this page: Vélocité Montpellier is an association whose goal is to promote cycling and to represent cyclists in and around Montpellier. Feel free to leave a comment on our facebook page if you’ve found this page useful or if you have any comments/suggestions.